"Janáček" redirects here. For other people with the surname, see Janáček (surname). Leoš Janáček (Czech pronunciation: [ˈlɛoʃ jaˈnaːtʃɛk] ( listen), baptised Leo Eugen Janáček; 3 July 1854 – 12 August 1928) was a Czech composer, musical theorist, folklorist, publicist and teacher. He was inspired by Moravian and other Slavic folk music to create an original, modern musical style. Leoš Janáček, son of schoolmaster Jiří (1815–1866) and Amalie (née Grulichová) Janáčková (1819–1884), was born in Hukvaldy, Moravia (then part of the Austrian Empire). He was a gifted child in a family of limited means, and showed an early musical talent in choral singing. His father wanted him to follow the family tradition and become a teacher, but he deferred to Janáček's obvious musical abilities. In 1865, young Janáček enrolled as a ward of the foundation of the Abbey of St. Thomas in Brno, where he took part in choral singing under Pavel Křížkovský and occasionally played the organ. One of his classmates, František Neumann, later described Janáček as an "excellent pianist, who played Beethoven symphonies perfectly in a piano duet with a classmate, under Křížkovský's supervision". Křížkovský found him a problematic and wayward student but recommended his entry to the Prague Organ School. Janáček later remembered Křížkovský as a great conductor and teacher. Janáček originally intended to study piano and organ but eventually devoted himself to composition. He wrote his first vocal compositions while choirmaster of the Svatopluk Artisan's Association (1873–76). In 1874, he enrolled at the Prague organ school, under František Skuherský and František Blažek. His student days in Prague were impoverished; with no piano in his room, he had to make do with a keyboard drawn on his tabletop. 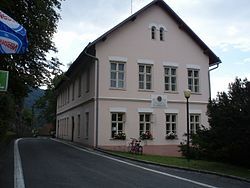 His criticism of Skuherský's performance of the Gregorian mass was published in the March 1875 edition of the journal Cecilie and led to his expulsion from the school, but Skuherský relented, and on 24 July 1875 Janáček graduated with the best results in his class. On his return to Brno he earned a living as a music teacher, and conducted various amateur choirs. From 1876 he taught music at Brno's Teachers Institute. 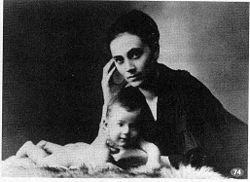 Among his pupils there was Zdenka Schulzová, daughter of Emilian Schulz, the Institute director. 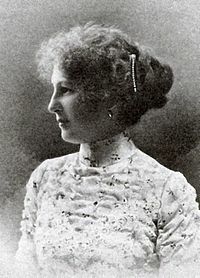 She was later to be Janáček's wife. In 1876, he also became a piano student of Amálie Wickenhauserová-Nerudová, with whom he co-organized chamber concertos and performed in concerts over the next two years. In February 1876, he was voted choirmaster of the Beseda brněnská Philharmonic Society. Apart from an interruption from 1879 to 1881, he remained its choirmaster and conductor until 1888. From October 1879 to February 1880, he studied piano, organ, and composition at the Leipzig Conservatory. While there, he composed Thema con variazioni for piano in B flat, subtitled Zdenka's Variations. Dissatisfied with his teachers (among them Oscar Paul and Leo Grill), and denied a studentship with Camille Saint-Saëns in Paris, Janáček moved on to the Vienna Conservatory, where from April to June 1880, he studied composition with Franz Krenn. He concealed his opposition to Krenn's neo-romanticism, but he quit Josef Dachs's classes and further piano study when he was criticised for his piano style and technique. He submitted a violin sonata (now lost) to a Vienna Conservatory competition, but the judges rejected it as "too academic". Janáček left the conservatory in June 1880, disappointed despite Franz Krenn's very complimentary personal report. He returned to Brno where on 13 July 1881, he married his young pupil Zdenka Schulzová. 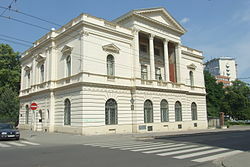 In 1881, Janáček founded and was appointed director of the organ school, and held this post until 1919, when the school became the Brno Conservatory. In the mid-1880s, Janáček began composing more systematically. Among other works, he created the Four male-voice choruses (1886), dedicated to Antonín Dvořák, and his first opera, Šárka (1887–88). During this period he began to collect and study folk music, songs and dances. In the early months of 1887, he sharply criticized the comic opera The Bridegrooms, by Czech composer Karel Kovařovic, in a Hudební listy journal review: "Which melody stuck in your mind? Which motif? Is this dramatic opera? No, I would write on the poster: 'Comedy performed together with music', since the music and the libretto aren't connected to each other". Janáček's review apparently led to mutual dislike and later professional difficulties when Kovařovic, as director of the National Theatre in Prague, refused to stage Janáček's opera Jenůfa. From the early 1890s, Janáček led the mainstream of folklorist activity in Moravia and Silesia, using a repertoire of folk songs and dances in orchestral and piano arrangements. Most of his achievements in this field were published in 1899–1901 though his interest in folklore would be lifelong. His compositional work was still influenced by the declamatory, dramatic style of Smetana and Dvořák. He expressed very negative opinions on German neo-classicism and especially on Wagner in the Hudební listy journal, which he founded in 1884. The death of his second child, Vladimír, in 1890 was followed by an attempted opera, Beginning of the Romance (1891) and the cantata Amarus (1897). In the first decade of the 20th century, Janáček composed choral church music including Otčenáš (Our Father, 1901), Constitutes (1903) and Ave Maria (1904). In 1901, the first part of his piano cycle On an Overgrown Path was published and gradually became one of his most frequently-performed works. In 1902, Janáček visited Russia twice. On the first occasion he took his daughter Olga to St. Petersburg, where she stayed to study Russian. Only three months later, he returned to St. Petersburg with his wife because Olga had become very ill. They took her back to Brno, but her health worsened. Janáček expressed his painful feelings for his daughter in a new work, his opera Jenůfa, in which the suffering of his daughter had transfigured into Jenůfa's. When Olga died in February 1903, Janáček dedicated Jenůfa to her memory. The opera was performed in Brno in 1904, with reasonable success, but Janáček felt this was no more than a provincial achievement. He aspired to recognition by the more influential Prague opera, but Jenůfa was refused there (twelve years passed before its first performance in Prague). Dejected and emotionally exhausted, Janáček went to Luhačovice spa to recover. There he met Kamila Urválková, whose love story supplied the theme for his next opera, Osud (Destiny). In 1905, Janáček attended a demonstration in support of a Czech university in Brno, where the violent death of František Pavlík, a young joiner, at the hands of the police inspired his piano sonata, 1. X. 1905 (From The Street). The incident led him to further promote the anti-German and anti-Austrian ethos of the Russian Circle, which he had co-founded in 1897 and which would be officially banned by the Austrian police in 1915. In 1906, he approached the Czech poet Petr Bezruč, with whom he later collaborated, composing several choral works based on Bezruč's poetry. These included Kantor Halfar (1906), Maryčka Magdónova (1908), and Sedmdesát tisíc (1909). Janáček's life in the first decade during the 20th century was complicated by personal and professional difficulties. He still yearned for artistic recognition from Prague. He destroyed some of his works, others remained unfinished. Nevertheless, he continued composing, and would create several remarkable choral, chamber, orchestral and operatic works, the most notable being the 1914 cantata, Věčné evangelium (The Eternal Gospel), Pohádka (Fairy tale) for cello and piano (1910), the 1912 piano cycle V mlhách (In the Mists) and his first symphonic poem Šumařovo dítě (A Fiddler's Child). His fifth opera, Výlet pana Broučka do měsíce, composed from 1908 to 1917, has been characterized as the most "purely Czech in subject and treatment" of all of Janáček's operas. In 1916, he started a long professional and personal relationship with theatre critic, dramatist and translator Max Brod. In the same year, Jenůfa, revised by Kovařovic, was finally accepted by the National Theatre. Its performance in Prague in 1916 was a great success, and brought Janáček his first acclaim. He was 62. Following the Prague première, he began a relationship with singer Gabriela Horváthová, which led to his wife Zdenka's attempted suicide and their "informal" divorce. A year later (1917), he met Kamila Stösslová, a young married woman 38 years his junior, who was to inspire him for the remaining years of his life. He conducted an obsessive and (on his side at least) passionate correspondence with her, of nearly 730 letters. From 1917 to 1919, deeply inspired by Stösslová, he composed The Diary of One Who Disappeared. As he completed its final revision, he began his next 'Kamila' work, the opera Káťa Kabanová. In 1920, Janáček retired from his post as director of the Brno Conservatory but continued to teach until 1925. In 1921, he attended a lecture by the Indian philosopher-poet Rabindranath Tagore and used a Tagore poem as the basis for the chorus The Wandering Madman (1922). At the same time, he encountered the microtonal works of Alois Hába. In the early 1920s, Janáček completed his opera The Cunning Little Vixen, which had been inspired by a serialized novella in the newspaper Lidové noviny. In Janáček's 70th year (1924), his biography was published by Max Brod, and he was interviewed by Olin Downes for The New York Times. In 1925, he retired from teaching but continued composing and was awarded the first honorary doctorate to be given by Masaryk University in Brno. In the spring of 1926, he created his Sinfonietta, a monumental orchestral work, which rapidly gained wide critical acclaim. In the same year, he went to England at the invitation of Rosa Newmarch. A number of his works were performed in London, including his first string quartet, the wind sextet Youth, and his violin sonata. Shortly after, and still in 1926, he started to compose a setting to an Old Church Slavonic text. The result was the large-scale orchestral Glagolitic Mass. Janáček was an atheist, and critical of the organized Church, but religious themes appear frequently in his work. 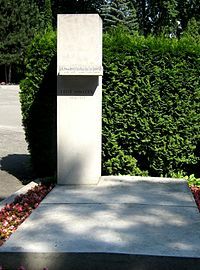 [dead link] The Glagolitic Mass was partly inspired by the suggestion by a clerical friend and partly by Janáček's wish to celebrate the anniversary of Czechoslovak independence. In 1927 – the year of the Sinfonietta's first performances in New York, Berlin and Brno – he began to compose his final operatic work, From the House of the Dead, the third Act of which was found on his desk after his death. In January 1928, he began his second string quartet, the Intimate Letters, his "manifesto on love". Meanwhile, the Sinfonietta was performed in London, Vienna and Dresden. In his later years, Janáček became an international celebrity. He became a member of the Prussian Academy of Arts in Berlin in 1927, along with Arnold Schoenberg and Paul Hindemith. His operas and other works were finally performed at the world stages. In August 1928, he took an excursion to Štramberk with Kamila Stösslová and her son Otto but caught a chill, which developed into pneumonia. He died on 12 August 1928 in Ostrava, at the sanatorium of Dr. L. Klein. He was given a large public funeral that included music from the last scene of his Cunning Little Vixen and was buried in the Field of Honour at the Central Cemetery, Brno. Janáček worked tirelessly throughout his life. He led the organ school, was a Professor at the teachers institute and gymnasium in Brno, collected his "speech tunes" and was composing. From an early age, he presented himself as an individualist and his firmly formulated opinions often led to conflict. He unhesitatingly criticized his teachers, who considered him a defiant and anti-authoritarian student. His own students found him strict and uncompromising. Vilém Tauský, one of his pupils, described his encounters with Janáček as somewhat distressing for someone unused to his personality and noted that Janáček's characteristically staccato speech rhythms were reproduced in some of his operatic characters. In 1881, Janáček gave up his leading role with the Beseda brněnská, as a response to criticism, but a rapid decline in Beseda's performance quality led to his recall in 1882. In 1917, he began his lifelong, inspirational and unrequited passion for Kamila Stösslová, who neither sought nor rejected his devotion. Janáček pleaded for first-name terms in their correspondence. In 1927, she finally agreed and signed herself "Tvá Kamila" (Your Kamila) in a letter, which Zdenka found. This revelation provoked a furious quarrel between Zdenka and Janáček, though their living arrangements did not change – Janáček seems to have persuaded her to stay. In 1928, the year of his death, Janáček confessed his intention to publicize his feelings for Stösslová. Max Brod had to dissuade him. Janáček's contemporaries and collaborators described him as mistrustful and reserved, but capable of obsessive passion for those he loved. His overwhelming passion for Stösslová was sincere but verged upon self-destruction. Their letters remain an important source for Janáček's artistic intentions and inspiration. His letters to his long-suffering wife are, by contrast, mundanely descriptive. Zdenka seems to have destroyed all hers to Janáček. Only a few postcards survive. In 1874, Janáček became friends with Antonín Dvořák, and began composing in a relatively traditional Romantic style. After his opera Šárka (1887–1888), his style absorbed elements of Moravian and Slovak folk music. His musical assimilation of the rhythm, pitch contour and inflections of normal Czech speech (Moravian dialect) helped create the very distinctive vocal melodies of his opera Jenůfa (1904), whose 1916 success in Prague was to be the turning point in his career. In Jenůfa, Janáček developed and applied the concept of "speech tunes" to build a unique musical and dramatic style quite independent of "Wagnerian" dramatic method. He studied the circumstances in which "speech tunes" changed, the psychology and temperament of speakers and the coherence within speech, all of which helped render the dramatically truthful roles of his mature operas, and became one of the most significant markers of his style. Janáček took these stylistic principles much farther in his vocal writing than Modest Mussorgsky, and thus anticipates the later work of Béla Bartók. The stylistic basis for his later works originates in the period of 1904–1918, but Janáček composed the majority of his output – and his best known works – in the last decade of his life. Much of Janáček's work displays great originality and individuality. It employs a vastly expanded view of tonality, uses unorthodox chord spacings and structures, and often, modality: "there is no music without key. Atonality abolishes definite key, and thus tonal modulation.... Folksong knows of no atonality." Janáček features accompaniment figures and patterns, with (according to Jim Samson) "the on-going movement of his music...similarly achieved by unorthodox means; often a discourse of short, 'unfinished' phrases comprising constant repetitions of short motifs which gather momentum in a cumulative manner." Janáček named these motifs "sčasovka" in his theoretical works. "Sčasovka" has no strict English equivalent, but John Tyrrell, a leading specialist on Janáček's music, describes it as "a little flash of time, almost a kind of musical capsule, which Janáček often used in slow music as tiny swift motifs with remarkably characteristic rhythms that are supposed to pepper the musical flow." Janáček's use of these repeated motifs demonstrates a remote similarity to minimalist composers (Sir Charles Mackerras called Janáček "the first minimalist composer"). Janáček's life has been featured in several films. In 1974 Eva Marie Kaňková made a short documentary Fotograf a muzika (The Photographer and the Music) about the Czech photographer Josef Sudek and his relationship to Janáček's work. In 1983 the Brothers Quay produced a stop motion animated film, Leoš Janáček: Intimate Excursions, about Janáček's life and work, and in 1986 the Czech director Jaromil Jireš made Lev s bílou hřívou (Lion with the White Mane), which showed the amorous inspiration behind Janáček's works. In Search of Janáček is a Czech documentary directed in 2004 by Petr Kaňka, made to celebrate the 150th anniversary of Janáček's birth. An animated cartoon version of The Cunning Little Vixen was made in 2003 by the BBC, with music performed by the Deutsches Symphonie-Orchester Berlin and conducted by Kent Nagano. A rearrangement of the opening of the Sinfonietta was used by the progressive rock band Emerson, Lake & Palmer for the song "Knife-Edge" on their 1970 debut album. Asteroid 2073 Janáček, discovered in 1974 by Luboš Kohoutek, is named in his honor. Czech musicology at the beginning of the 20th century was strongly influenced by Romanticism, in particular by the styles of Wagner and Smetana. Performance practises were conservative, and actively resistant to stylistic innovation. During his lifetime, Janáček reluctantly conceded to Karel Kovařovic's instrumental rearrangement of Jenůfa, most noticeably in the finale, in which Kovařovic added a more "festive" sound of trumpets and French horns, and doubled some instruments to support Janáček's "poor" instrumentation. 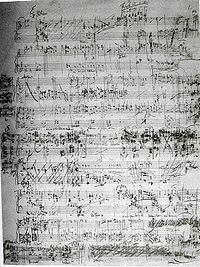 The score of Jenůfa was later restored by Charles Mackerras, and is now performed according to Janáček's original intentions. Janáček came from a region characterized by its deeply rooted folk culture, which he explored as a young student under Pavel Křížkovský. His meeting with the folklorist and dialectologist František Bartoš (1837–1906) was decisive in his own development as a folklorist and composer, and led to their collaborative and systematic collections of folk songs. Janáček became an important collector in his own right, especially of Lachian, Moravian Slovakian, Moravian Wallachian and Slovakian songs. From 1879, his collections included transcribed speech intonations. He was one of the organizers of the Czech-Slavic Folklore Exhibition, an important event in Czech culture at the end of 19th century. From 1905 he was President of the newly instituted Working Committee for Czech National Folksong in Moravia and Silesia, a branch of the Austrian institute Das Volkslied in Österreich (Folksong in Austria), which was established in 1902 by the Viennese publishing house Universal Edition. Janáček was a pioneer and propagator of ethnographic photography in Moravia and Silesia. In October 1909 he acquired an Edison phonograph and became one of the first to use phonographic recording as a folklore research tool. Several of these recording sessions have been preserved, and were reissued in 1998. ^ a b Plumley, Gavin. "Janáček: a brief biography". Retrieved 15 September 2008. ^ Tyrrell, John (1982). Káťa Kabanová. Cambridge: Cambridge University Press. p. 2. ISBN 978-0-521-29853-7. ^ "Mša glagolskaja". Leoš Janáček (Gavin Plumley's site). Retrieved 8 January 2009. ^ a b c d Katya Kabanova (Prague National Theatre, Jaroslav Krombholc) (CD). Leoš Janáček. Prague: Supraphon. p. 6. 108016-2612. ^ Katya Kabanova (Prague National Theatre, Jaroslav Krombholc) (CD). Leoš Janáček. Prague: Supraphon. p. 7. 108016-2612. ^ "Janáček, From the House of the Dead". Retrieved 8 January 2009. ^ "Recenze DVD: Josef Sudek". Nostalghia.cz. Retrieved 8 January 2009. ^ "Lev s bílou hřívou" (in Czech). Česká a slovenská filmová databáze. Retrieved 8 January 2009. ^ "Leoš Janáček: The Cunning Little Vixen". music web-international.com. Retrieved 8 January 2009. ^ "Janáček Philharmonic Orchestra, Ostrava". official website. Archived from the original on 18 July 2011. Retrieved 18 March 2012. ^ "Ostrava Centre for New Music". Retrieved 3 July 2011. ^ "(2073) Janáček". (2073) Janáček In: Dictionary of Minor Planet Names. Springer. 2003. p. 168. doi:10.1007/978-3-540-29925-7_2074. ISBN 978-3-540-29925-7. ^ "Janáček Carves with a Knife; Suk Draws with the Most Delicate Pen". Taras Bulba, Ripening (CD). Leoš Janáček; Josef Suk. Prague: Supraphon. 2005. p. 8. SU-3823-2. ^ "Editio Janáček". Editio Janáček. Retrieved 15 November 2014. ^ "Nejstarší nahrávky moravského a slovenského zpěvu 1909–1912" (in Czech). Gnosis Brno. Archived from the original on 26 August 2007. Retrieved 18 March 2012. Chisholm, Erik (1971). The Operas of Leoš Janáček. ISBN 978-0-08-012854-2. Fenomén Janáček včera a dnes. Sborník z mezinárodní hudebněvědné konference (in Czech). Brno: Brno Conservatory. 2006. ISBN 978-80-87005-00-2. Firkušný, Leoš (2005). Janáčkův život (in Czech). Prague. Hollander, Hans (1963). Janáček. London. p. 119. Kundera, Milan (1996). Testaments Betrayed. London: Faber and Faber. ISBN 978-0-571-17337-2. Kundera, Milan (2004). Můj Janáček (in Czech). Brno: Atlantis. ISBN 978-80-7108-256-9. Ort, Jiří (2005). Pozdní divoch. Láska a život Leoše Janáčka v operách a dopisech (in Czech). Prague: Mladá fronta. ISBN 978-80-204-1256-0. Samson, Jim (1977). Music in Transition: A Study of Tonal Expansion and Atonality, 1900–1920. New York: W.W. Norton & Company. p. 67. ISBN 978-0-393-02193-6. Sehnal, Jiří; Vysloužil, Jiří (2001). Dějiny hudby na Moravě. Vlastivěda moravská (in Czech). Brno: Muzejní a vlastivědná společnost. ISBN 978-80-7275-021-4. Štědroň, Bohumír (1946). Janáček ve vzpomínkách a dopisech (in Czech). Prague: Topičova edice. Tyrrell, John (2006–2007). Janáček: Years of a Life. A two-volume biography of the composer. London: Faber and Faber. ISBN 978-0-571-17538-3. (Volume 1 – The Lonely Blackbird), (Volume 2 – Tsar of the Forests). Tyrrell, John (1991–1992). Česká opera (in Czech). Brno: Opus Musicum. ISBN 978-80-900314-1-8. Tyrrell, John; Mackerras, Charles (2003). "My Life With Janáček's Music (Sir Charles Mackerras in conversation with the Janáček specialist John Tyrrell)". The Cunning Little Vixen, Sinfonietta, Schluck und Jau, Jealousy... (CD). Leoš Janáček (Czech Philharmonic Orchestra, Charles Mackerras). Prague: Supraphon. p. 13. SU 3739-2. Vysloužil, Jiří (2001). Hudební slovník pro každého II (in Czech). Vizovice: Lípa. ISBN 978-80-86093-23-9. Beckerman, Michael (1994). Janáček as Theorist. Stuyvesant, NY: Pendragon Press. ISBN 978-0-945193-03-6. Simeone, Nigel; Tyrrell, John; Němcová, Alena (1997). Janáček's works. A catalogue of the music and writings of Leoš Janáček. Oxford: Clarendon. ISBN 978-0-19-816446-3. Tauský, Vilém and Margaret (1982). Leoš Janáček: Leaves from his Life. Kahn & Averill, London. ISBN 978-1-871-08208-1. Tyrrell, John (2005). Intimate Letters: Leoš Janáček to Kamila Stösslová. London: Faber and Faber. ISBN 978-0-571-22510-1. Tyrrell, John (1992). Janáček's operas – A documentary account. Princeton: Princeton University Press. ISBN 978-0-691-09148-8. Vogel, Jaroslav (1997). Leoš Janáček: a biography. Prague: Academia. ISBN 978-80-200-0622-6. Zemanová, Mirka (1989). Janácek's Uncollected Essays on Music. Marion Boyars. ISBN 978-0-71452-857-1.